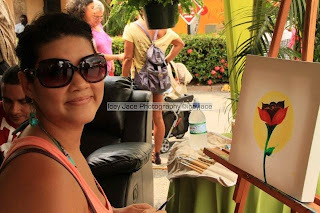 In its ninth staging, The Liguanea Art Festival (LAF) returns on Sunday April 29, 2012, featuring over 80 artists—the island’s largest outdoor art festival of this kind. This year the Festival proudly celebrate Jamaica’s 50th, “A Nation on a Mission”, thus culminating with the largest festival ever planned, with a diverse and exciting line-ups of artists. The exhibitors will represent the very best in drawing, painting, photography, ceramics, sculpture and jewellery. Established favourites like Gene Pearson, Franz Marzouca, David and Allison Sinclair, and Owen Beckford, will be joined this year by award-winning sculptor Laura Facey. Facey, is most well known for Redemption Song—the monument at the entrance to Emancipation Park—and will be appearing with pieces from her recent RADIANT COMBS show, as well as other work. As always, the LAF committee will also be producing a publication to accompany the event. While the format of the magazine evolved over the years, it is now an established book that is a wonderful companion for the Festival. “The art festival book is an essential part of the Festival experience,” says creative designer of the magazine, Mark Weinberger. “Not only does it incorporate editorial featuring upcoming artists, and stories about the art scene in the Caribbean, but is also a wonderful resource for members of the art community after the Festival.” Magazines can be purchased at the event, and after the event at Liguanea Drug & Garden Centre. This year’s sponsors include: Jamaica National Building Society, Liguanea Drug & Garden Centre, General Food Supermarket, Victoria Mutual Building Society, Cari-Med, CVM-TV, RJR Communications Group, The Jamaica Observer, First Global Bank, Kirk Distributors, The Best Dressed Chicken, Dewlands Juices, Grace Foods, Hopwood, National Bakery, Olay Skin Care, Scotiabank, The Solid Agency, Wisynco, ZIP & Irie FM. Presented to the public free of cost, the event will be held in the parking lot of Liguanea Plaza from 10:00AM to 8:00PM. Ample additional parking and shuttle services will be provided at the Sts. Peter & Paul Church grounds and Mailpac Services on Old Hope Road.